Osaka (Japanese: 大阪市 Hepburn: Ōsaka-shi, pronounced [oːsakaɕi]; commonly just 大阪, Ōsaka, [oːsaka] (listen)) is a designated city in the Kansai region of Japan. It is the capital city of Osaka Prefecture and the largest component of the Keihanshin Metropolitan Area, the second largest metropolitan area in Japan and among the largest in the world with over 19 million inhabitants. Osaka will host Expo 2025. The current mayor of Osaka is Ichiro Matsui. Some of the earliest signs of human habitation in the Osaka area at the Morinomiya ruins (森ノ宮遺跡 Morinomiya iseki) comprise shell mounds, sea oysters and buried human skeletons from the 6th–5th centuries BC. It is believed that what is today the Uehonmachi area consisted of a peninsular land with an inland sea in the east. During the Yayoi period, permanent habitation on the plains grew as rice farming became popular. Osaka residents were stereotyped in Edo literature from at least the 18th century. Jippensha Ikku in 1802 depicted Osakans as stingy almost beyond belief. In 1809, the derogatory term "Kamigata zeeroku" was used by Edo residents to characterize inhabitants of the Osaka region in terms of calculation, shrewdness, lack of civic spirit, and the vulgarity of Osaka dialect. Edo writers aspired to samurai culture, and saw themselves as poor but generous, chaste, and public spirited. Edo writers by contrast saw "zeeroku" as obsequious apprentices, stingy, greedy, gluttonous, and lewd. To some degree, Osaka residents are still stigmatized by Tokyo observers in the same way today, especially in terms of gluttony, evidenced in the phrase, "Residents of Osaka devour their food until they collapse" (大阪は食倒れ "Ōsaka wa kuidaore"). Osaka is located in the humid subtropical climate zone (Köppen Cfa), with four distinct seasons. Its winters are generally mild, with January being the coldest month having an average high of 9.3 °C (49 °F). The city rarely sees snowfall during the winter. Spring in Osaka starts off mild, but ends up being hot and humid. It also tends to be Osaka's wettest season, with the tsuyu (梅雨 tsuyu, "plum rain") — the rainy season — occurring between early June (average:Jun.7) to late July (average:Jul.21). Summers are very hot and humid. In August, the hottest month, the average daily high temperature reaches 33.5 °C (92 °F), while average nighttime low temperatures typically hover around 25.5 °C (78 °F). Fall in Osaka sees a cooling trend, with the early part of the season resembling summer while the latter part of fall resembles winter. Precipitation is abundant, with winter being the driest season, while monthly rainfall peaks in June with the "tsuyu" rainy season, which typically ends in mid to late July. From late July through the end of August, summer's heat and humidity peaks, and rainfall decreases some. Osaka experiences a second rainy period in September and early October, when tropical weather systems, including typhoons, coming from the south or southwest are possible. Minami, though meaning "south", is essentially in Chūō Ward (中央区 Chūō-ku) and geographically central within the city. Well known districts here include Namba and Shinsaibashi shopping areas, the Dōtonbori canal entertainment area, Nipponbashi Den Den Town, as well as arts and fashion culture-oriented areas such as Amerikamura and Horie. Cerezo Osaka (セレッソ大阪, Seresso Ōsaka) is a Japanese football team, currently playing in the J.League. The team name Cerezo (Spanish for cherry tree) is also the flower of Ōsaka city. The official home town for the team are Osaka City and Sakai City. Gamba Osaka (ガンバ大阪, Gamba Ōsaka) is a Japanese professional association football club, currently playing in the J1 League. The team's name Gamba comes from the Italian word "gamba" meaning "leg" and the Japanese ganbaru (頑張る), meaning "to do your best" or "to stand firm". Located in Suita, Osaka, the team's home stadium is Suita City Football Stadium. Gamba Osaka is currently the second-most accomplished J.League club, having won 8 top-tier domestic titles as well as the 2008 AFC Champions League. 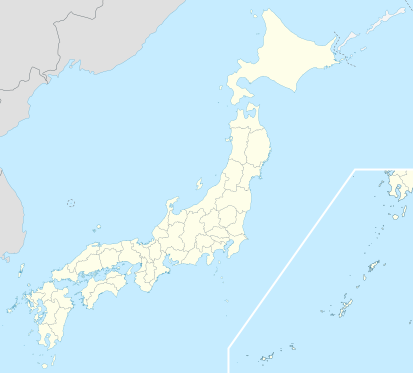 Higashiōsaka (東大阪市, Higashiōsaka-shi, literally "East Osaka City") is a city located in Osaka Prefecture, Japan. The city is known as one of the industrial cities of Japan and "the rugby football town". As of October 1, 2016, the city has an estimated population of 500,463 and a population density of 8,100 persons per km². The total area is 61.81 km². The IWGP Heavyweight Championship (IWGPヘビー級王座, IWGP hebī-kyū ōza) is a professional wrestling world heavyweight championship owned by the New Japan Pro-Wrestling (NJPW) promotion. "IWGP" is the initialism of NJPW's governing body, the International Wrestling Grand Prix. The title was introduced on June 12, 1987, in the finals of an IWGP tournament. Osaka International Airport (大阪国際空港, Ōsaka Kokusai Kūkō) (IATA: ITM, ICAO: RJOO), often referred to as Itami Airport (伊丹空港, Itami Kūkō) is the primary regional airport for the Kansai region of Japan, including the major cities of Osaka, Kyoto and Kobe. It is classified as a first class airport. Despite its "international" designation, the airport's scheduled passenger air traffic is entirely domestic. Kansai International Airport (43 kilometres (27 mi) away) took over the region's international traffic in 1994 and competes with Itami for domestic traffic. Itami also faces competition from Kobe Airport (26 kilometres (16 mi) away), a smaller domestic airport opened in 2006. The airport was named after the city of Itami, Hyōgo Prefecture because most of its land is located there. A portion of the airport property is also located in Toyonaka and Ikeda cities of Osaka Prefecture. The terminal complex is located in all three of these cities, and the only access from the Itami side is via a long tunnel that passes below the runway and apron. In FY2006, Itami was Japan's 3rd busiest airport and the Kansai region's busiest. In 2015, this airport had 139,450 aircraft movements, serving 14,541,936 domestic passengers and carrying 140,668 metric tons of freight cargo. The J1 League (J1リーグ, J1 Rīgu) is the top division of the Japan Professional Football League (日本プロサッカーリーグ, Nihon Puro Sakkā Rīgu) and the top professional association football J.League in Japan. It is one of the most successful leagues in Asian club football. Currently, the J1 League is the first level of the Japanese association football league system. The second tier is represented by the J2 League. It is currently sponsored by Meiji Yasuda Life and thus officially known as the Meiji Yasuda J1 League. Until the 2014 season it was named the J.League Division 1. In 2016, 25.2 million passengers used the airport making it the 30th busiest airport in Asia and 3rd busiest in Japan. Freight volume was at 802,162 tonnes total, of which 757,414 t were international (18th in the world), and 44,748 t were domestic. The 4,000 m × 60 m (13,123 ft × 197 ft) second runway was opened on 2 August 2007. As of June 2014, Kansai Airport has become an Asian hub, with 780 weekly flights to Asia and Australasia (including freight 119), 59 weekly flights to Europe and the Middle East (freight 5), and 80 weekly flights to North America (freight 42). Keihanshin (京阪神, "Kyoto-Osaka-Kobe") is a metropolitan region in Japan encompassing the metropolitan areas of the cities of Kyoto in Kyoto Prefecture, Osaka in Osaka Prefecture and Kobe in Hyōgo Prefecture. The entire region has a population (as of 2010) of 19,341,976 over an area of 13,033 km2 (5,032 sq mi). It is the second-most-populated urban region in Japan (after the Greater Tokyo area), containing approximately 15% of Japan's population. The GDP in Osaka-Kobe is $681 billion as measured by PPP as of 2015, making it one of the world's most productive regions, a match with Paris and London. MasterCard Worldwide reported that Osaka is the 19th ranking city of the world's leading global cities and has an instrumental role in driving the global economy. If Keihanshin were a country, it would be the 16th-largest economy in the world, with a GDP of nearly $953.9 billion in 2012.The name Keihanshin is constructed by extracting a representative kanji from Kyoto (京都), Osaka (大阪), and Kobe (神戸), but using the Chinese reading instead of the corresponding native reading for each of the characters taken from Osaka and Kobe, and the Kan-on Chinese reading of the character for Kyoto instead of the usual Go-on Chinese reading. The Mainichi Shimbun (毎日新聞, Mainichi Shimbun, literally "Daily News") is one of the major newspapers in Japan, published by The Mainichi Newspapers Co., Ltd (株式会社毎日新聞社, Kabushiki-gaisha Mainichi Shimbunsha). In addition to the Mainichi Shimbun, which is printed twice a day in several local editions, Mainichi also operates an English language news website called The Mainichi (previously Mainichi Daily News), and publishes a bilingual news magazine, Mainichi Weekly. It also publishes paperbacks, books and other magazines, including a weekly news magazine, Sunday Mainichi. Naomi Osaka (大坂 なおみ, Ōsaka Naomi, born October 16, 1997) is a professional tennis player who represents Japan. She is the reigning champion in women's singles at the US Open and the Australian Open. Osaka is ranked No. 1 in the world by the Women's Tennis Association (WTA), and is the first Asian player to hold the top ranking in singles. She has won three titles and reached five finals on the WTA Tour. Born in Japan to a Haitian father and a Japanese mother, Osaka has lived in the United States since she was three years old. She came to prominence at the age of sixteen when she defeated former US Open champion Samantha Stosur in her WTA Tour debut at the 2014 Stanford Classic. Two years later, she reached her first WTA final at the 2016 Pan Pacific Open in Japan to enter the top 50 of the WTA rankings. Osaka made her breakthrough into the upper echelon of women's tennis in 2018, when she won her first WTA title at the Indian Wells Open. In September, she won the US Open, defeating 23-time major champion Serena Williams in the final to become the first Japanese player to win a Grand Slam singles tournament. She won her second Grand Slam title at the 2019 Australian Open. Osaka is known for her multi-ethnic background and her shy, candid personality. On the court, she has an aggressive playing style with a powerful serve that can reach 125 miles per hour (200 km/h). Osaka Castle (大坂城 or 大阪城,, Ōsaka-jō) is a Japanese castle in Chūō-ku, Osaka, Japan. The castle is one of Japan's most famous landmarks and it played a major role in the unification of Japan during the sixteenth century of the Azuchi-Momoyama period. Osaka Metro (Ōsaka Metoro) is the rapid transit network in the Osaka Metropolitan Area of Japan, operated by Osaka Metro Co., Ltd. (大阪市高速電気軌道株式会社, Ōsaka Kōsoku Denki Kidō Kabushiki-gaisha, lit. “Osaka Rapid Electric Tramway, KK”). 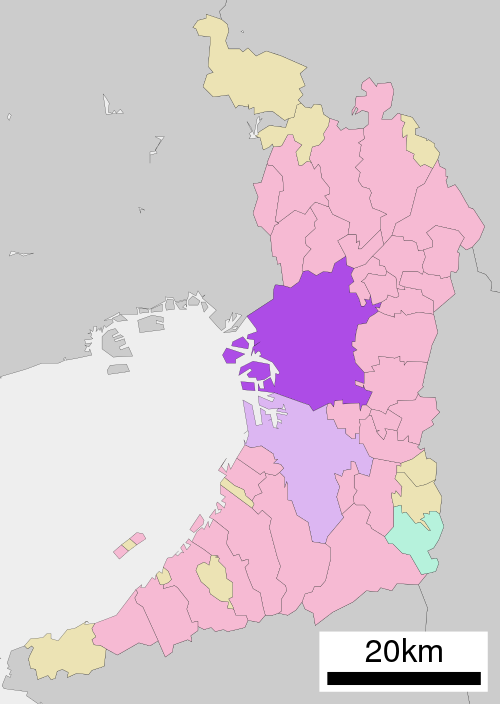 It serves the city of Osaka and the adjacent municipalities of Higashiosaka, Kadoma, Moriguchi, Sakai, Suita, and Yao. Osaka Metro forms an integral part of the extensive mass transit system of Greater Osaka (part of the Kansai region), having 123 out of the 1,108 rail stations (2007) in the Osaka-Kobe-Kyoto region. In 2010, the greater Osaka region had 13 million rail passengers daily (see Transport in Keihanshin) of which the Osaka Municipal Subway (as it was then known) accounted for 2.29 million.Osaka Metro is the only subway system in Japan to be legally classified as a tramway, whereas all other subway systems in Japan are legally classified as railways. Despite this, it has characteristics typical of that of a full-fledged metro system.Until March 31, 2018, the network was operated by the Osaka Municipal Transportation Bureau as Osaka Municipal Subway, and was the oldest publicly-operated subway network in Japan, having begun operations in 1933. A proposal to privatize the Osaka subway was sent to the city government in February 2013 and was given final approval in 2017. The rationale behind privatization is that it would bring private investors to Osaka and could help revive Osaka's economy. The new private operator took over operations on April 1, 2018. Osaka University (大阪大学, Ōsaka daigaku), or Handai (阪大, Handai), is a public research university located in Osaka Prefecture, Japan. Osaka University is one of Japan's National Seven Universities and is generally considered one of Japan's most prestigious institutions of higher learning. It is usually ranked among the top three public universities in Japan, along with the University of Tokyo and Kyoto University. It is ranked third overall among Japanese universities and 67th worldwide in the 2019 QS World University Rankings. The Japanese Ministry of Education, Culture, Sports, Science and Technology has classified Osaka University as a leading university in the Top Global University Project. The ministry also selected Osaka University as a Designated National University Corporation in 2018.Osaka University was the sixth modern university in Japan at its founding in 1931. However, the history of the institution includes much older predecessors in Osaka such as the Kaitokudō founded in 1724 and the Tekijuku founded in 1838. Numerous prominent scholars and scientists have attended or worked at Osaka University, such as Nobel Laureate in Physics Hideki Yukawa, manga artist Osamu Tezuka, Lasker Award winner Hidesaburō Hanafusa, author Ryōtarō Shiba, and discoverer of regulatory T cells Shimon Sakaguchi. Sakai (堺市, Sakai-shi) is a city located in Osaka Prefecture, Japan on the edge of Osaka Bay at the mouth of the Yamato River. It has been one of the largest and most important seaports of Japan since the Medieval era. Following the February 2005 annexation of the town of Mihara (from Minamikawachi District), the city grew to the fourteenth most populous city in Japan, with 833,544 residents as of January 1, 2018.The current city was legally founded on April 1, 1889 according to the laws of Imperial Japan. Sakai became a designated city in April 2006 giving it a greater measure of self-determination in governmental affairs. It is divided into seven districts. The Sumitomo Group (Japanese: 住友グループ, Hepburn: Sumitomo Gurūpu) is one of the largest Japanese keiretsu, or business groups, founded by Masatomo Sumitomo around 1615. West Japan Railway Company (西日本旅客鉄道株式会社, Nishi-Nihon Ryokaku Tetsudō Kabushiki-gaisha), also referred to as JR-West (JR西日本, Jeiāru Nishi-Nihon), is one of the Japan Railways Group (JR Group) companies and operates in western Honshu. It has its headquarters in Kita-ku, Osaka. Yanmar Stadium Nagai (ヤンマースタジアム長居) is an athletic stadium in Osaka, Japan. It is the home ground of J. League club Cerezo Osaka. The stadium has a seating capacity of 47,000.